Earlier today, we told you that Carphone Warehouse has started taking pre-orders for the BlackBerry Priv. While the Android-powered slider still needs to be officially introduced by BlackBerry, such a move appears imminent. The company has posted a video showing off the first BlackBerry device driven by the open source Android OS. Based on the Carphone Warehouse pre-order page, the Priv features a 5.4-inch 1440 x 2560 QHD resolution screen. The Snapdragon 808 chipset is under the hood, carrying a hexa-core CPU and the Adreno 418 GPU. 3GB of RAM is inside, along with 32 GB of internal storage. Those who need additional storage can access the 2TB microSD slot. The rear-facing 18MP camera offers OIS to keep images from turning out shaky, and the front-facing 2MP snapper will shoot selfies and handle video chat. BlackBerry handsets are known for having good battery life, and the 3410mAh juicer will keep the lights on for a long time. And yes, as odd as it feels to type it, Android 5.1.1 is pre-installed. Check out the first official video for the BlackBerry Priv merely by clicking on the video below. While the Android-powered slider still needs to be officially introduced by BlackBerry, such a move appears imminent. 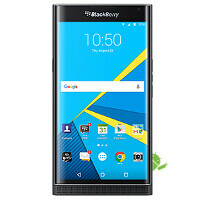 Read more athttp://www.phonearena.com/news/Official-BlackBerry-Priv-video-released_id74805#caGrFkhqZC7gC9yV.99 Alan, you need to visitwww.blackberry.ca or just blackberry.com, they're official now, in their official websites. Check it out mahn. I couldn't find the official release. Could you post the Priv's page link?. The Priv hasn't been officially released, John. I think what he meant was that while we know it's been officially announced by Blackberry, it hasn't been officially introduced at a press event like they've done with the Passport and Classic. Blackberry isn't known for having great cameras. And you're known for trolling blackberry. Read any review for a Blackberry phone and you'll see most comments say the camera is ok to decent to subpar depending on which model you're looking at. It's easy to just use an insult, but it takes far more effort to make a decent, backed-by-facts comment. Then again I shouldn't be surprised considering who I'm responding to. Oh and to the 4+ ones thumbing him up, my comment applies as much to you as it does him. Nice! The Z10 held its own. Great decent, backed-by-facts comment. +1 In my opinion it won by a longshot especially in the low-light photos. Totally agree with you there. I find that using the camera on my Passport, in comparison to other smartphones, that it performs quite admirably as well. Well at least you said in your opinion instead of shoving your point down everyone's throat but I still disagree. Take a look over youtube comments and look that it isnt only my opinion but majority says Z10 takes better photos, hate it or love it. Maybe so, but I still think the experience is better overall on the iPhone. I stand corrected if I had happened to be corrected. My comment still stands. Yep, that you have nothing better to do than troll blackberry. He's not wrong. You are widely known for trolling, especially BB articles. Oh yes, I absolutely love trolling blackberry articles. Or maybe you have no real response to what I said, so you resort to the comment above because in reality, you know I'm right. Refer to post #44 and you're done. Refer to post #41 and you're done. Lol your comebacks are so bad, you just copy people like a child. Why even bother mate? Well I have to bring my comebacks down to your grade level. That's becuase you have zero.